A custom-made work is always a tremendous challenge to an artist; the initial steps are taken in the first discussions with the customer, when we change opinions. Also the premises, where the finished painting will be hung, are crucially important and I always try to make sure I visit that place before I grab my paintbrush. The location, the compass points, the direction of the light, the architecture, the acoustics – they all have to be taken into account. The starting point of a commissioned work is always confidentional; no matter if the employer is a gallery, a company, a community or a private person. Then the creative work starts in my brain; the primordial storm of emotions. The first strokes of the paintbrush on the canvas mark the beginning of an adventure – a journey that doesn’t end when the painting is unveiled. Every spectator, who watches the painting, sees and feels the work in a personal way – and every interpretation is unique, important and absolutely correct. That is why the adventure – as all good art – is immortal and will never die. My employer was Teemu Selänne – a man who is familiar to all Finland and all the world, at least to the part that follows ice hockey. The composition is built of two elements; the table, which is moving – as Teemu always is – and the two callas in the background. The candelabra holds six candles; Teemu’d six-member family is his strongest support. The treasure chest reminds us of his economic success and contains his most valued symbols, in a pennant; a hockey stick, a golf club, a four-leaf clover and a heart. The globe symbols Teemu’s international career and life; you can also find the logos of his teams “Jokerit” and “Anaheim Ducks”. Champagne, glasses and rose tell us about the mutual moments of Teemu and his wife Sirpa. But where is Teemu’s favorite number, the lucky eight? Than number of eternity can be seen in the two callas in the back. This is the sparkling world of Teemu Selänne. The customer was a family company “Onninen”, operating in various fields of industrial wholesale, preparing for its 100th anniversary. 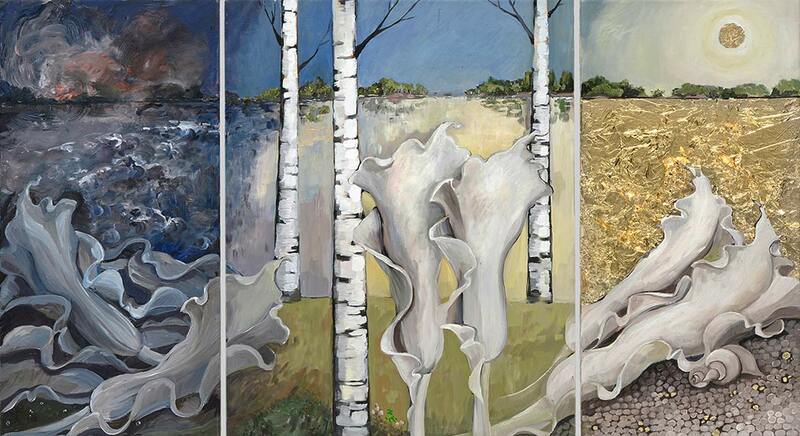 The painting turned out to be a triptych, in three parts. My goal was to portrait not only the history of the company, but the future as well – and to provoke thoughts and energy in the employees but, also in the visitors. The first part shows us a black storm, depicting the hardships and downturns a company has to face. The second part is Finnishness; the blue-and-white colors of the company. Every-day work leads towards the common goals. The third part is made of dreams; successes in the past and in days to come. As the title implies, the triptych contains at least a hundred stories. Let every viewer find a new one! This paiting is the altarpiece of the Säkylä church – a part of entity of which the third part was not originally realized. The first part depicts the Last Communion, the second part the Crucifixion, and the enormous challenge and honor of painting the missing third part – Resurrection – fell on my shoulders. I was using my daughter Olivia as a model when I was sketching. 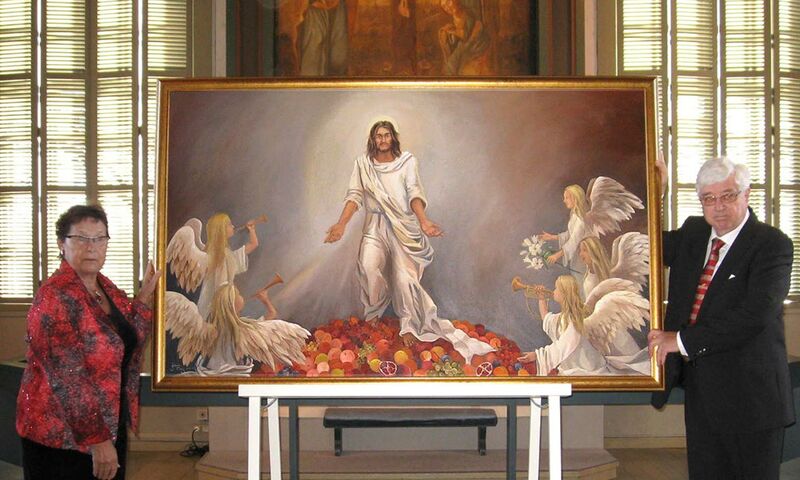 In the final painting, Jesus welcomes the spectator with open arms, as the angels are rejoicing around him. We see a fruit heaven in his feet; the gifts of the earth. There is a flicker of question in his eyes; but also, forgiveness. 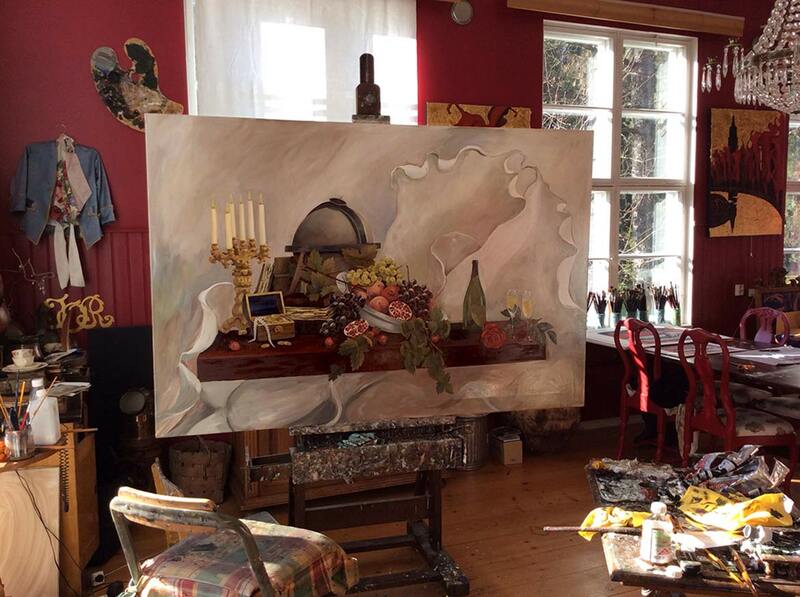 The painting was unveiled in the Säkylä Church 2011 and is still very important to me; also, a new milestone as an artist.